For anyone interested in lighthouses, Galicia offers a range of different designs, locations and in some cases histories, along its many rias and extensive coastline. This particular lighthouse is found by following the signs for the large beach and dune national park complex called Corrubedo. It is fairly close to the large town of Ribeira and also close to *****. 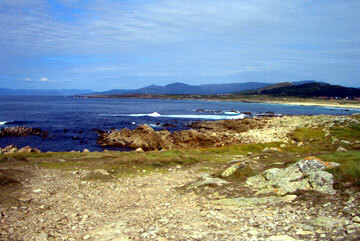 It is reached from the main coast road that runs from Ribeira all the way up to la Coruna. Right, the lighthouse as seen from below on the seaward side. The lighthouse becomes visible quite some distance before you reach it and it sits, quite literally, at the end of a long straight narrow road. Compared with many other lighthouses this one is quite small and certainly not that high, however when you look at it from the seaward side you realise that the natural elevation of its position more than compensates for this lack of height. Below left, the view as you approach. This lighthouse is still a working example and although you can walk around it there is no visitor centre or information connected with it. That should not deter anyone from visiting it though, as its position and the large outcrop of rock on which it stands offer some stunning views of the adjacent coastline and beaches. In fact, it offers one of the best views of the ria de Noia i Muros with the high peak of Monte Louro facing the lighthouse on the opposite side of the ria. The other point worthy of mention is the fact that there is a significant sloping area of land and rocks between the lighthouse and the sea and many people go to this lighthouse to wonder around this scenic piece of landscape. For those interested in lighthouses, there are two other structures that should interest you. 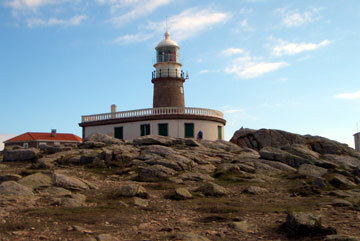 The first is the Tower of Hercules, a 2,000 year old Roman lighthouse in the city of la Coruna. 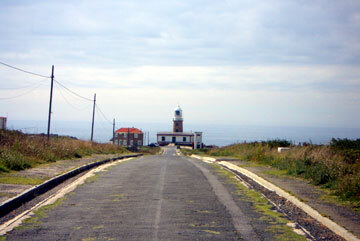 The second is a Lighthouse (near Camarinas). Both of these structures are on a much greater scale and both do have visitor centres and information available about them. Right, the seascape as you look back in towards the ria. This part of the coast is filled with beaches large and small.